These meatballs with green beans and tomatoes are genuinely good, and not just good considering that it’s a low-carb recipe. It’s something everyone can enjoy, which is great for families where not everyone is following the same diet plan, and it makes great leftovers. Meatball recipes typically involve breadcrumbs, which is right out for my purposes, so some inventiveness was called for in figuring out a recipe that would look and taste like meatballs and still be cohesive enough to hold together through the cooking process. The first few attempts fell apart in a most unappetizing way, but I’m happy to report that this recipe turns out perfectly. Preheat the oven to 475° and generously spray a large baking sheet with non-stick cooking spray. In a bowl, combine all the meatball ingredients. Using your hands, smoosh everything together until it is it well mixed, and then roll out small meatballs between your palms and place them on the baking sheet. Try to get them a uniform size so that they will bake evenly. 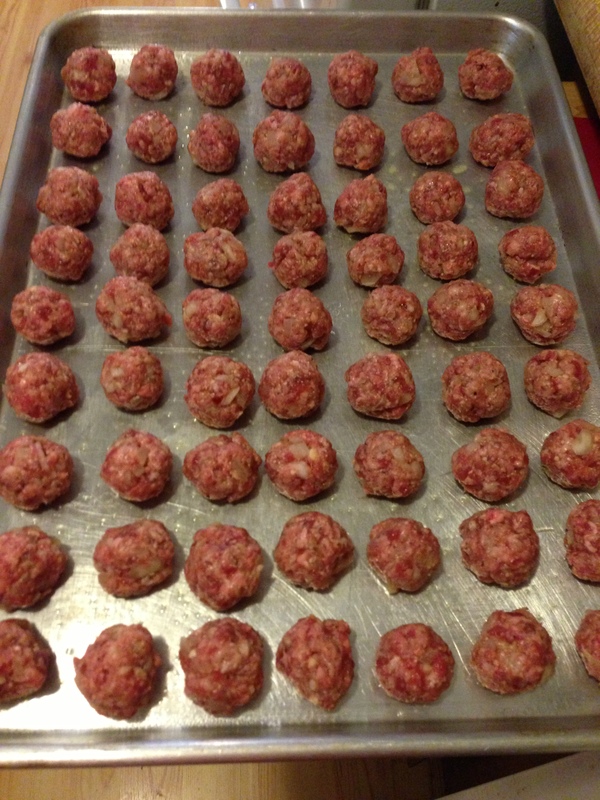 I made mine about the size of a shooter marble and came out with 63 total, which made for a nice 9 x 7 grid of meatballs. Bake the meatballs at 475° for 15 minutes, keeping an eye on them so they don’t get too browned. If you’re quick, you can get the rest of the ingredients ready while the meatballs are baking. In a large 5 qt saute pan (one that is ovensafe with an ovensafe lid), saute the rest of the onions in a little olive oil, and when they’re almost translucent, add the garlic. When the onions are cooked, turn off the heat, and add in the tomatoes, water, basil, salt, pepper and chili powder. Sprinkle just a little xanthan gum over the tomatoes and stir it well; about 1/4 of a teaspoon should be enough to make the liquid into a light sauce. Add the green beans and stir everything together. When the meatballs are done, take them from the oven and turn the oven down to 350°. 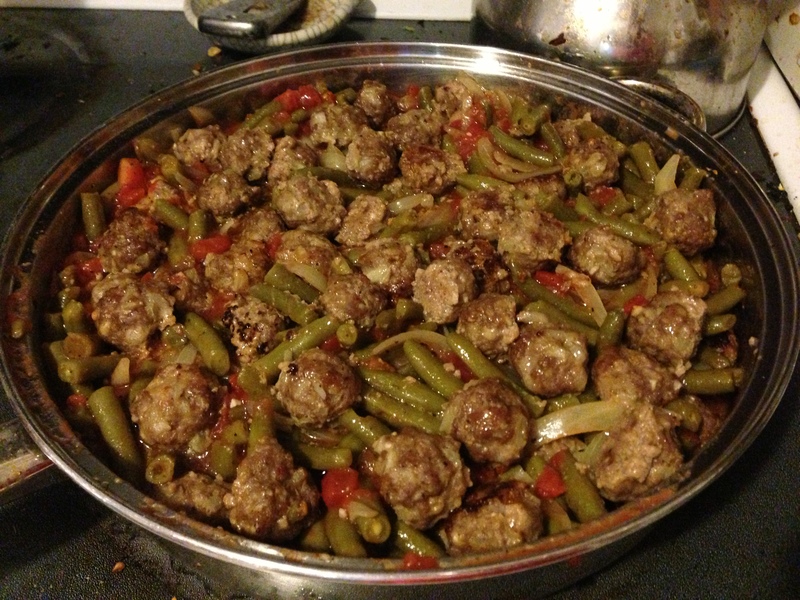 Put about half of them into the green beans and tomatoes, and gently spoon the vegetables over the top so the meatballs are towards the bottom of the pan. 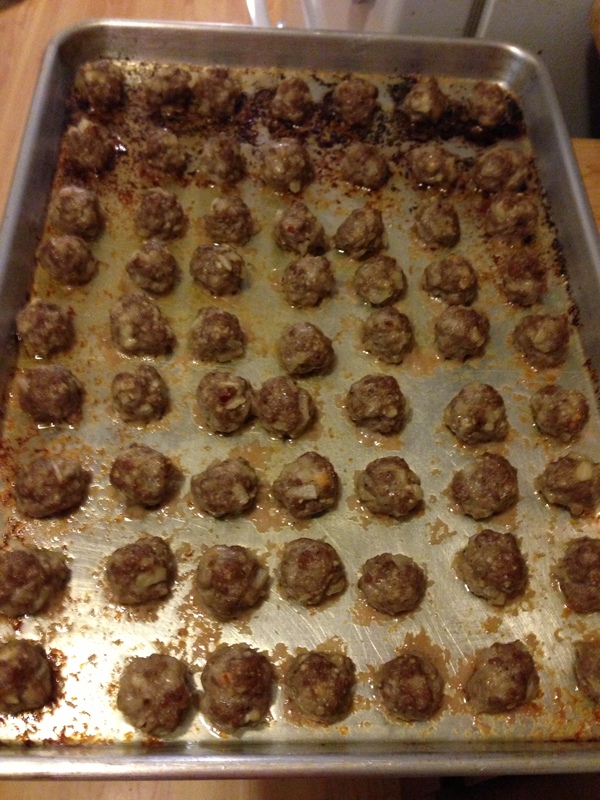 Put the rest of the meatballs on top and spread them around evenly. Put the lid on the pan and put it in the oven for 1 hour at 350°. If you don’t have an ovensafe saute pan with an ovensafe lid, you can put everything into a lidded casserole dish. It’s ready to serve when it comes out of the oven. It goes really well with mashed cauliflower or mashed potatoes. The creamy texture of the mashed veggie-of-your-choice is delightful with the green beans and tomato sauce. Enjoy!